The internet seems to have transformed all industries except one: scholarly communication. Jason Priem has studied academics’ use of Twitter and charts terrific interest among academics in the social media tool as an aid to discuss literature, for teaching and to enrich conferences among his results. In 1990, Tim Berners-Lee created the Web as a tool for scholarly communication at CERN. In the two decades since, his creation has gone on to transform practically every enterprise imaginable, except somehow, scholarly communication. Here, instead, we lurch ponderously through the time-sanctified dance of dissemination, 17th-century style. The article reigns. Scholars continue to wad the vibrant, diverse results of their creativity and expertise – figures, datasets, programs, abstracts, annotations, claims, reviews, comments, collections, workflows, discussions, arguments and programs – into publishers’ slow moulds to be cast into articles: static, leaden information ingots. Growing numbers of scholars, though, are realizing that this approach is no longer the best we can do. We’re defrosting our digital libraries, moving over a million personal reference collections online to services like Zotero and Mendeley (and in the process making the open reference list a new kind of publication). Scholars are flocking to scholarly blogs to post ideas, collaborate with colleagues, and discuss literature, often creating a sort of peer-review after publication. Emboldened by national mandates and notable successes, we’re beginning to publish reusable datasets as first-class citizens in the scholarly conversation. We’re sharing our software as publications and on the Web. The journal was the first revolution in scholarly communication; we’re on the brink of a second, driven by the new diversity, speed, and accessibility of the Web. The poster child for this Scholcomm Spring is Twitter. There’s been terrific interest in scholars using Twitter to discuss and cite literature, for teaching, to enrich conferences, or less formally as a “global faculty lounge.” We recently finished a large study to get better data on these uses. Twitter adoption is broad-based: scholars from different fields and career stages are taking to Twitter at about the same rate. Scholars are using Twitter as a scholarly medium, making announcements, linking to articles, even engaging in discussions about methods and literature. But the majority of most scholars’ tweets are personal, underscoring Twitter as a space of context collapse, where users manage multiple identities. 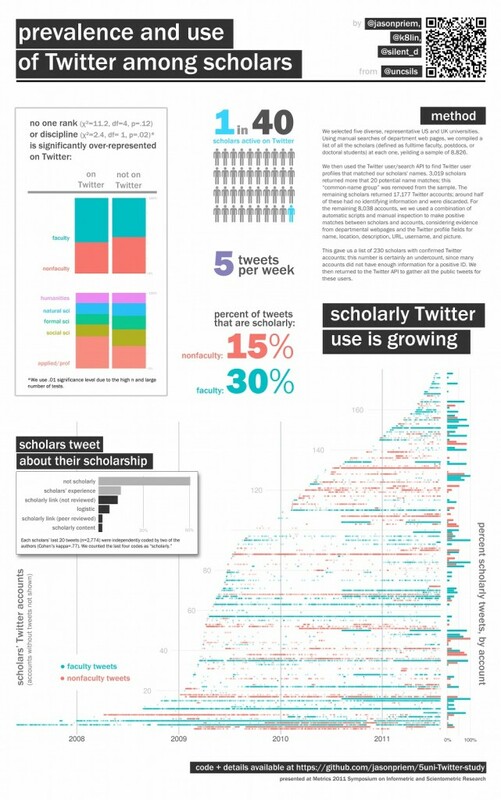 Only about 1 in 40 scholars has an actively-updated Twitter account. This may seem small, but keep in mind that Twitter is only 5 years old; email was still a scholarly novelty 15 years after its creation. Taking the long view, the current count of scholars using Twitter is probably less important than its continued growth, which we see clearly. Results like these are encouraging for those of us who see social media and related environments as the natural next frontier for communicating scholarship. It seems that scholars, without waiting for approval from the mandarins of the publishing industry, are beginning to explore and colonize the Web’s wide-open spaces. But perhaps the most exciting thing about this nascent scholarly great migration is that the new, online tools of scholarship begin to give public substance to the formally ephemeral roots of scholarship: the discussions never transcribed, the annotations never shared, the introductions never acknowledged, the manuscripts saved and reread but never cited. These backstage activities are now increasingly tagged, catalogued, and archived on blogs, Mendeley, Twitter, and elsewhere. As more scholars move more of their workflows to the public Web, we are assembling a vast registry of intellectual transactions – a web of ideas and their uses whose timeliness, speed, and precision make the traditional citation network look primitive. I’ve been involved in early efforts to understand and use these new data sources to inform alternative metrics of impact, or “altmetrics.” Altmetrics could be used in evaluating scholars or institutions, complementing unidimensional citation counts with a rich array of indicators revealing diverse impacts on multiple populations. They could also inform new, real-time filters for scholars burdened by information overload: imagine a system that gathers and analyses the bookmarks, pageviews, tweets, and blog posts from your online networks, using your interactions with them to learn and display each day’s most important articles or posts. Even better, what if every scholar in the world had such a system? We might do away with journals entirely. The Web can disseminate and archive products for almost nothing. The slow, back-room machinations of closed peer review could be replaced by an open, accountable, distributed system that simply listens in to expert communities’ natural reactions to new work – the same way Google efficiently ranks the Web by listening in to the crowdsourced ‘review’ of the hyperlink network. Of course, this particular vision may not pan out. And although the current signs point toward more growth, scholars might get tired of Twitter. But to hang our hopes on a particular vision or tool is to miss what’s truly revolutionary about this moment. The journal monoculture, long the only viable approach to scholarly communication, is beginning to yield at its fringes to a more diverse, vibrant, online ecosystem of scholarly expression. This new ecosystem promises to change not only the way we express scholarship, but the way we measure, assess, and consume it. Very exciting research. Kudos on the infographic as well. Anecdotally, I too find that there are increasing numbers of scholarly clusters on Twitter. I do find however, that it’s difficult to navigate the hashtags used by these different clusters. Which of course, provides a challenge to being able to acknowledge the breadth of scholars on Twitter. A useful tool could be something that merely catalogs the hashtags being used by different scholarly communities. Your last paragraph states a world where journals are done away with entirely. I’m curious to see if that will ever become the case. It seems that people have a natural proclivity toward ‘bundling content under the umbrella of an authority.’ For instance, The New York Times is considered the “American newspaper of record” because people feel like the ‘bundle of content’ that they consume there is of higher quality than other newspapers. You could find other examples in entertainment sites or even this blog – which I read because I feel that the content here is better than elsewhere. For the record, I’m not saying that journals are the most efficient way to disseminate academic knowledge, but I’m merely curious to see if people can keep up with unbundled content. Hi, really great post, and a great infographic. My question is a deceptively simple one I guess, will you be writing this research up as a journal article? Yep, that’s the plan. I’m not sure, but perhaps you’re implying (quite legitimately) that I ought to put my money where my mouth is and just tweet the article, or use some other alternative route for dissemination? If so, I’d reply that I’m not arguing that there will be or should be instant transition in scholarly communication. Articles serve an important purpose in today’s world, and they will for some time–just as the horse-drawn buggy continued to serve important purposes well after the invention of the automobile. I am arguing that scholars are chafing against the glacial speed, inflated cost, and clunky quality-control of a system that’s built on an archaic, needlessly-restrictive set of technologies. The dissemination of this study’s early results are a case in point. By the time they’re (hopefully!) published in a journal, many well-connected scholars will have already had the interesting discussions and asked the interesting questions about the work. I’ve noted twitter used to ask for help with paleographical work, for seeking obscure knowledge as well as to share and pass on articles on online magazines and blogs. I was sceptical before I joined but it’s a potentially very powerful tool in research as well as in academic dissemination. The downside is having to plough through the tweets that are less relevant. As to the use for social interaction, if you eavesdrop on any two students in a college library, five will get you ten that it’s their love life under discussion not academe. The question, though, isn’t “do scholars often use Twitter for personal conversations?” Of course they do. They also use email for personal conversations, and before that, paper correspondence. The questions is rather, “do scholars use Twitter for professional communications often enough to be interesting?” In the case of email, and certainly in the case of paper letters, the answer is “yes.” And although we need to do more research in this area, our early findings suggest the answer is “yes” for Twitter, too.